Today a couple of hours past noon, Matt Mullenweg took to the stage to tell the world what is coming next for WordPress. Much like it happens at the State of the Word, Matt started to talk about the accomplishments of the different WordPress teams. Like CLI and the REST API who have been hard at work –along with everyone else–. WP CLI 2.0 is expected to be released on July with some major improvements. 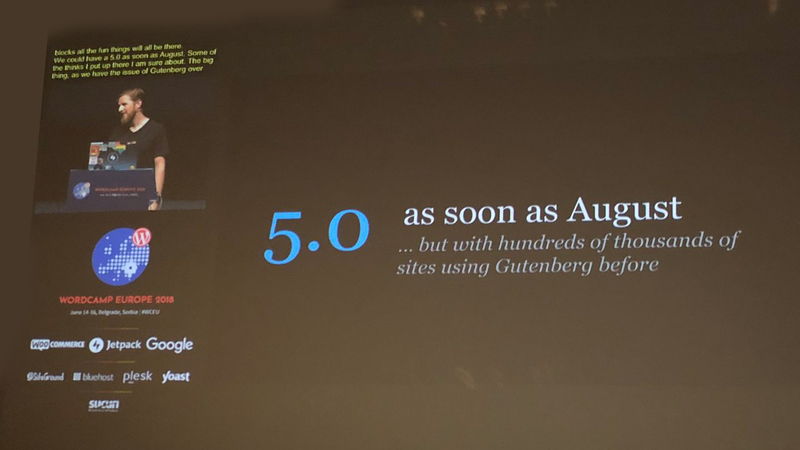 The REST API will release auto-save and search capabilities before August, and then of course, there’s Gutenberg. Yes, I know I am saying nothing new here. But probably, just probably, you have not taken the time to experience what Gutenberg really is. Just the day before I was telling the Training team about the need to stop the concept-separation between WordPress and Gutenberg. Gutenberg is the new WordPress. Once it gets merged into the core, we will be able to tell people with no technical background whatsoever, how to build a website for their small business faster than ever before. This is WordPress, here’s how you build a website! Gutenberg together with other WordPress features like The Customizer and the REST API really deliver on the promise of Content Publishing Democratization. Allowing more and more people to get online and get as creative as they can with a single set of tools, right out of the box. I truly liked how Matt replied to the question What’s the problem the Gutenberg is solving?. He said –I’m paraphrasing–, Gutenberg is giving us the foundation for the next 15 years of the web. Just to name a few of the reasons why this is HUGE, and not just for our community, but for the Internet as a whole. A game changer in deed. WordPress 5.0 was expected to be released last year. Sadly it was postponed, however we know now it could be released as soon as August. I want to thank every one on the organization team for the WordCamp Europe 2018. It is a daunting endeavor to organize an event such as this one. Remember we are all contributors here. The speakers, the organizers, the volunteers. Everyone who writes code, designs, contributes to the marketing efforts, builds awesome apps, pulls forward on the community. Everyone of you are making the web a better place, and it is because of your selfless efforts we get to enjoy this experience. Thanks to everyone who makes WordPress possible. The Community, the Sponsors, the users. Thank you all. If you liked this post share it with your friends on your social networks. My name is Page Carbajal. I am a Software Engineer and E-Commerce specialist working with Toptal. I also help organize the WordPress Meetup in Cancún.